Bashundhara LP Gas Head of Division (Marketing and Sales) Mir TI Faruk Rizvi speaks at a press conference at National Press Club in the capital on Thursday. Department of Explosives Chief Inspector Md Shamsul Alam was present on the occasion. Bashundhara LP Gas Ltd, a concern of the country’s leading business conglomerate Bashundhara Group, has expressed its commitment to continue its safety awareness programme and awareness campaign on LP (Liquefied Petroleum) gas and cylinder usage across the country. The Bashundhara LP Gas has long been running awareness campaign namely ‘Niarapad Abas (Safe Home)’ and recently launched another safety campaign ‘Nirapad Kormosthol (Safe Workplace). The premier LPG brand of the country on Thursday informed that they are going to run ‘Safe Workplace’ campaign around the country alongside its regular ‘safe home’ campaign. 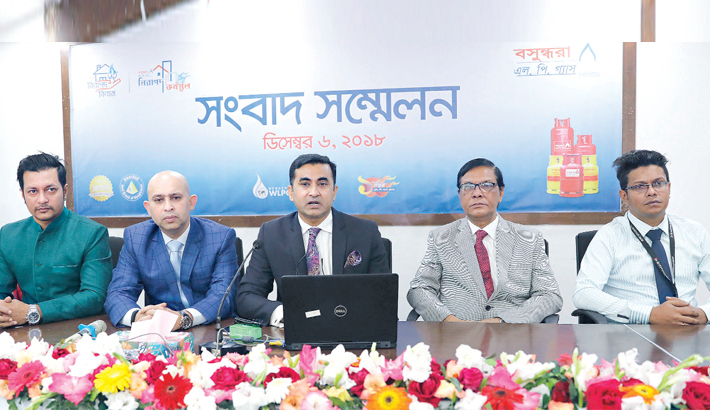 Bashundhara LP Gas Head of Division (Marketing and Sales) Mir TI Faruk Rizvi made the announcement at a press conference held at the National Press Club in the city on Thursday. Department of Explosives Chief Inspector Md Shamsul Alam was present at the programme as the chief guest while Bashundhara LP Gas Head of Division (Business Development) ZM Ahmed Prince and film star Mamnun Hasan Emon were also present on the occasion. Speaking on the occasion, Mir TI Faruk Rizvi said that the Bashundhara LP Gas not only does business, but also thinks about the safety and security of its users. As part of it, Bashundhara LP Gas has been running the ‘Safe Home’ campaign across the country and now added a new campaign ‘Safe Workplace’ which will begin from February in Feni. Usage of LP gas in the country has increased at a rate of 60 percent every year during the last five years. As the users of LPG are increasing, Bashundhara LP Gas is trying to reach out to every user to educate them about the safety measures of LPG usage. Extending his thanks to Bashundhara LPG Ltd, Department of Explosives Chief Inspector Md Shamsul Alam said that safety and security in using LP gas is quite important as LPG is a risky product. “Government alone is not able to aware every user. Business people also come forward to make aware about the LPG consumers and Bashundhara LP Gas Ltd is doing this job”, he said. About the recently LPG related incident, Shamsul Alam said their inspection found that incident took place for other reason including leakage problem rather for cylinder fault. There is no alternative of awareness to avoid such incident, he added. ZM Ahmed Prince said that they are running the campaigns from their social responsibility so that not a single incident happens due to unawareness. Actor Emon said being the number one LPG brand in the country, Bashundhara LP Gas also thinks about the safety of users.